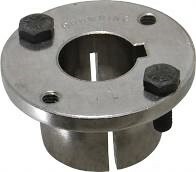 H Bushings use in AK- H and BK- H V-Belt Pulleys for desired shaft size for lower inventory cost. You can use the same bushing in all H style pulleys for added flexability of speed and ratio changes. Easy installation using 2 bolts provided with each bushing and for quick disconnect the bushings have 2 reverse thread tapped holes for easy removal.